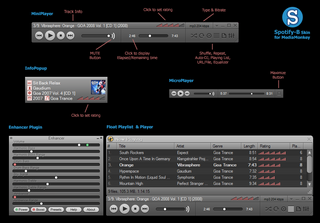 About: 2009-08-31 - V1.0 = Rough shape skin of the increasingly popular Spotify internet player. 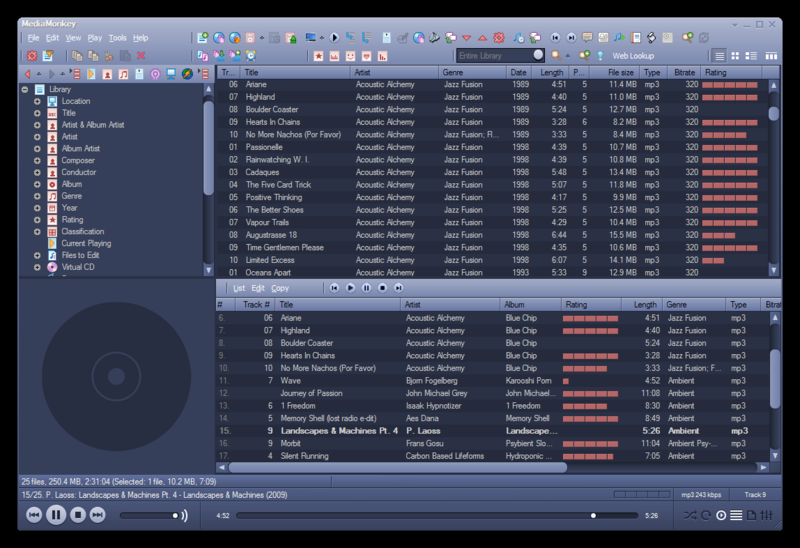 Description: As I did with Helium skin, my goal was to make MediaMonkey look like Spotify at possible, with my personal touch. I have kept Helium's first set of icons and changed their colors a bit. 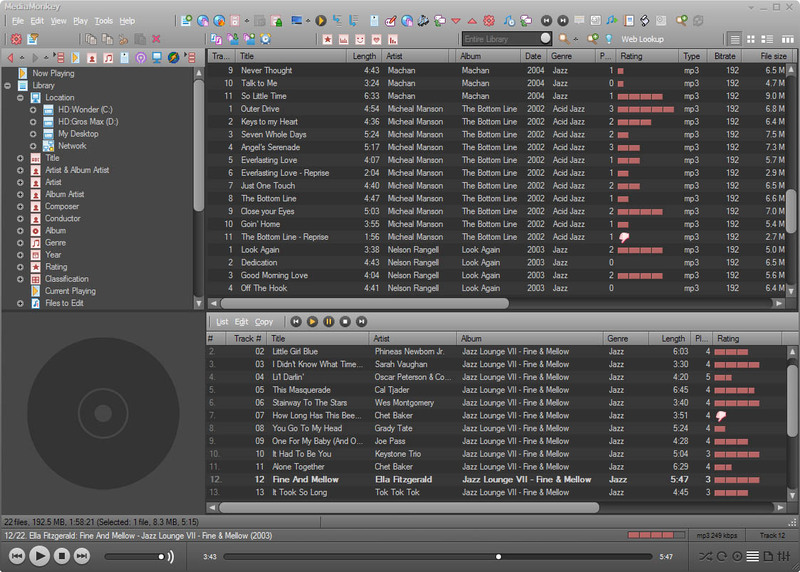 -> For Spotify v1.x, I recommend to use this skin in conjunction with Song Information Panel plugin. (See screenshot below). 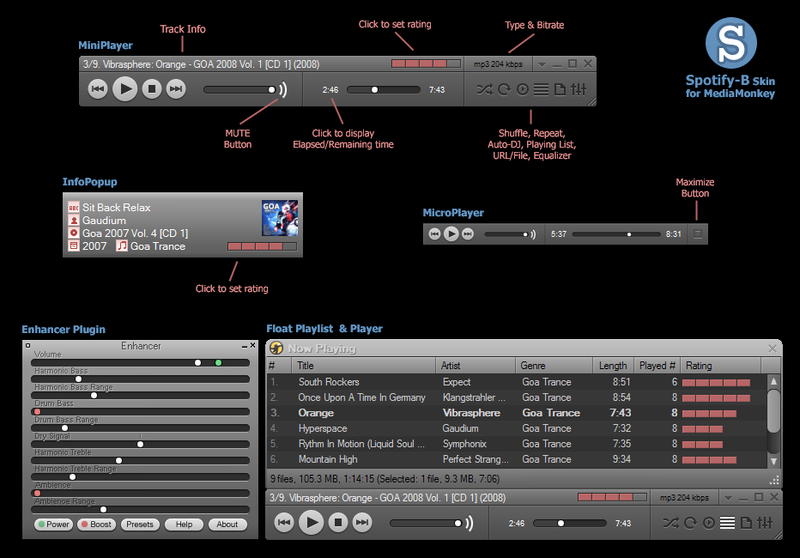 As Spotify, no track information is displayed on the main player, but it does on MiniPlayer. The player contains all the buttons (they are hidden in the logo in v1.0). 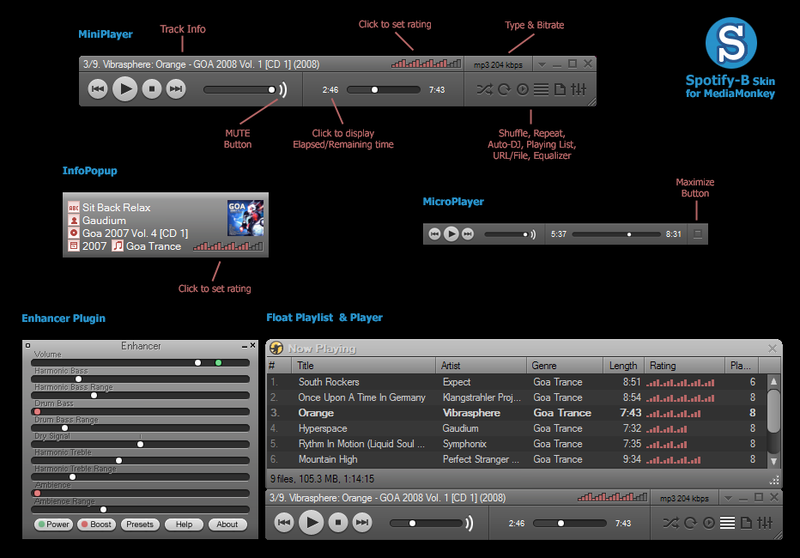 Includes InfoPopup box, resizable MiniPlayer, horizontal MicroPlayer. Matching themes for MonkeyRok, LyricsViewer, SongInformation, SkinSyle for auto-scripts (EV/MN/FS/RegExp...), Enhancer plugin, and CSS for CueReader script. MicroPlayer width can be changed by editing MicroPlayerH.ini file. (Instructions are in the file). 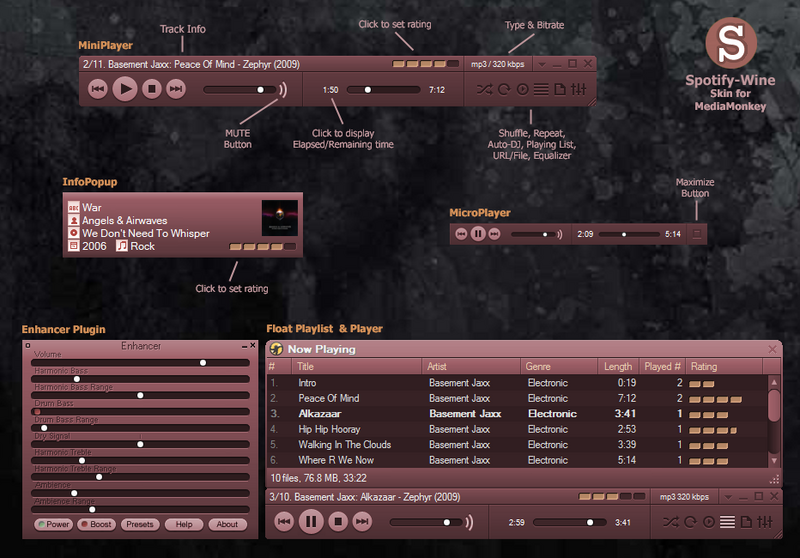 2009.08.31 - v1.0 Release of Spotify skin for MediaMonkey 3.x. 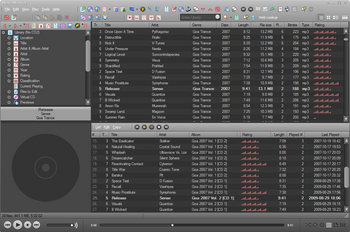 2009.09.07 - Added matching skin for Enhancer plugin for winamp. 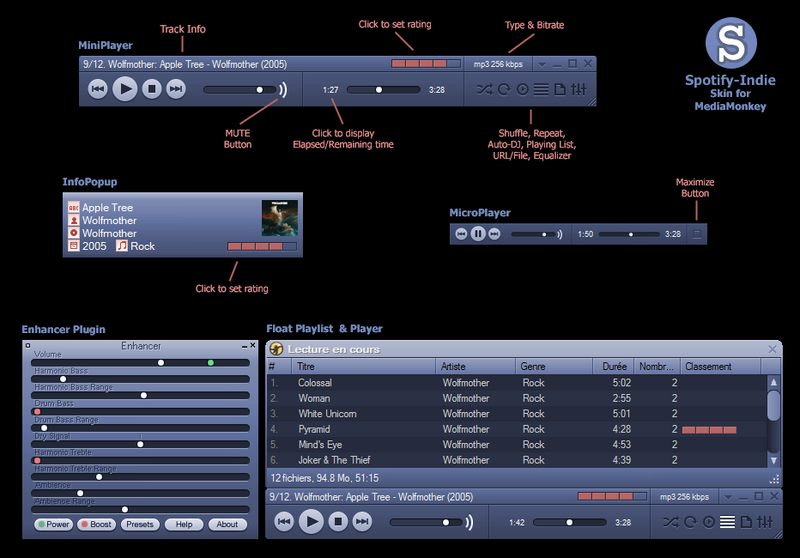 2009.10.21 - Spotify-B v1.2 : Blue highlight colors, Moveable player, Stop button, Set of real function buttons, Easier rating system (thanks to DreadM and to all users), New system buttons, Few modified icons. 2009.12.08 - Matching CSS (Custom Style Sheet) for CueReader script. 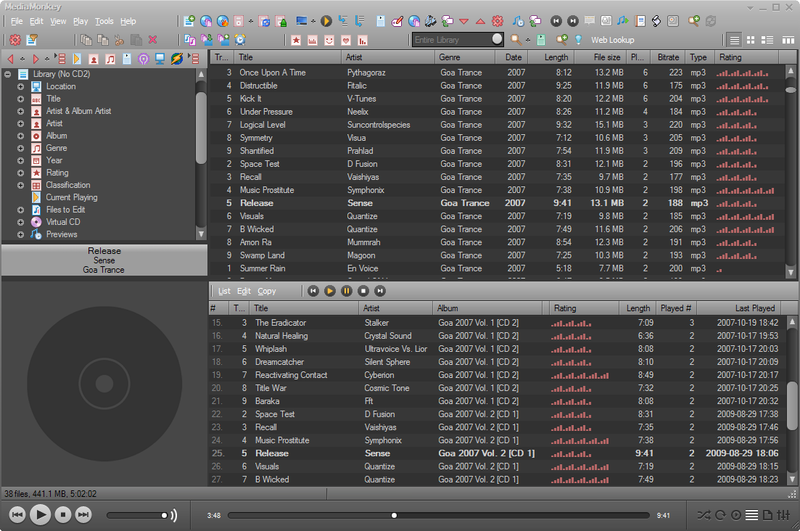 2010.01.02 - Spotify-Wine v2.1 New icons set and rating. Last edited by Eyal on Wed May 05, 2010 11:49 pm, edited 25 times in total. Looks nice and clean. I'll have to give it a try. Very nice Eyal, thank you. The lyricsviewer looks very good directly below the song information,too. Very interesting. I just tried it and while I'm not overly excited about the player the colors make it worth trying for awhile. Interesting rating images too. Nice job as always, Eyal. Okay, I've test-driven this since yesterday and have fallen in love with it. Now I'm torn between this and your Carbon Stone skin. I love the highlight colors, etc. in this one, it makes it a little different and still pleasing to the eye. Great job! Very well done Eyal, i don't know how you are skinning MM these days, its remarkable. Looking back to MM2 and the cheesy skins we thought were good at the time, we now have skins which practically resemble a similar program to MM. 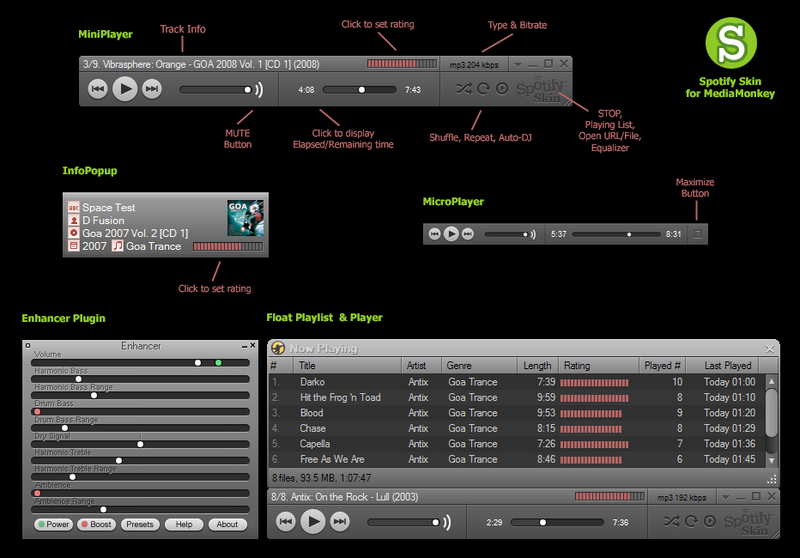 I don't actually use Spotify myself but i've heard about it and it's concept, so i checked up on what it looks like. The only one thing which i spotted (joke wasn't intended) is the Monkey Roks scrollbar which is square edged instead of curved edged like the rest of the skin. Carry on with the good work Eyal! @Just JP - Thanks. Spotify player caught my eye as soon as I saw it. @Benn - Thanks. I'm glad you like it. @Vyper - Thank you. I made highlight colors green instead of blue as in original player. I think it looks better that way. @Pman2009 - - Thanks. I appreciate. Plugins scripts (MonkeyRok, LyricsViewer and others) display a generated html page, shown in the panel. Thus, except for colors, element shapes such as scrollbars can't be changed. If there's a way, I don't know it yet. I'll search for it. So, anybody tried yet the buttons hidden in "Spotify" logo? Lol I didnt notice them. They amused me very much! I like this skin. I like spotify too. I made a new version of Song Information Panel. 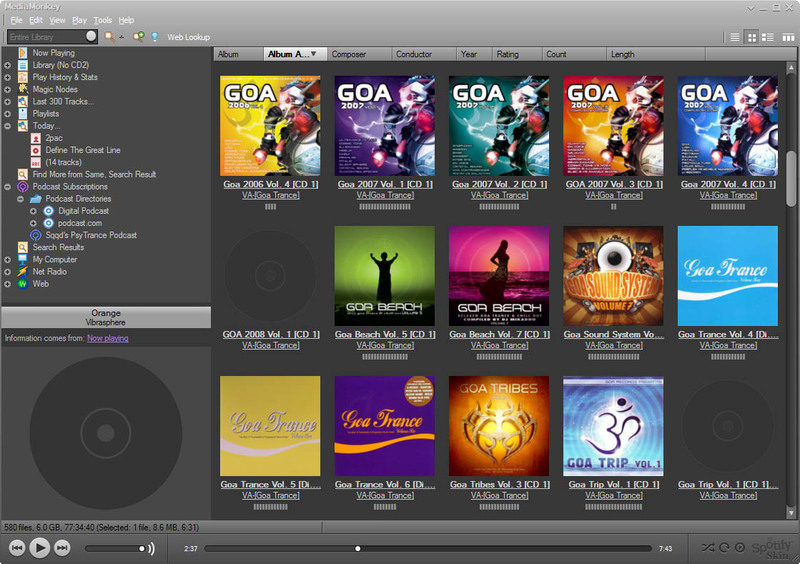 Now you can hide the nw playing/selected track link and make this skin look even more like spotify. 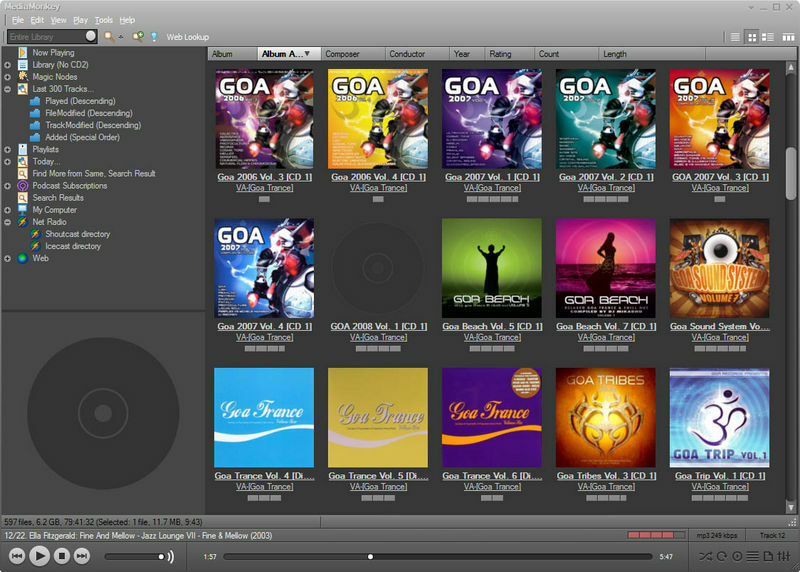 Eyal wrote: So, anybody tried yet the buttons hidden in "Spotify" logo? Sneaky... I had no idea! 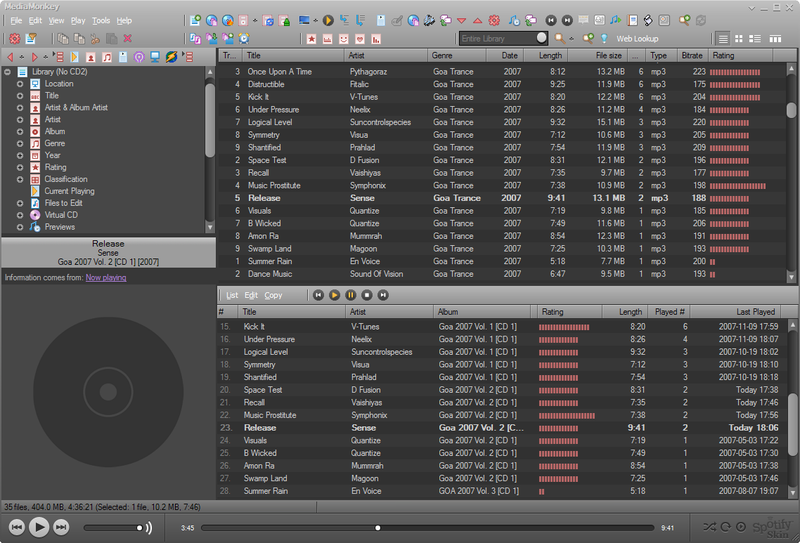 Nice Eyal ,I like the player layout. 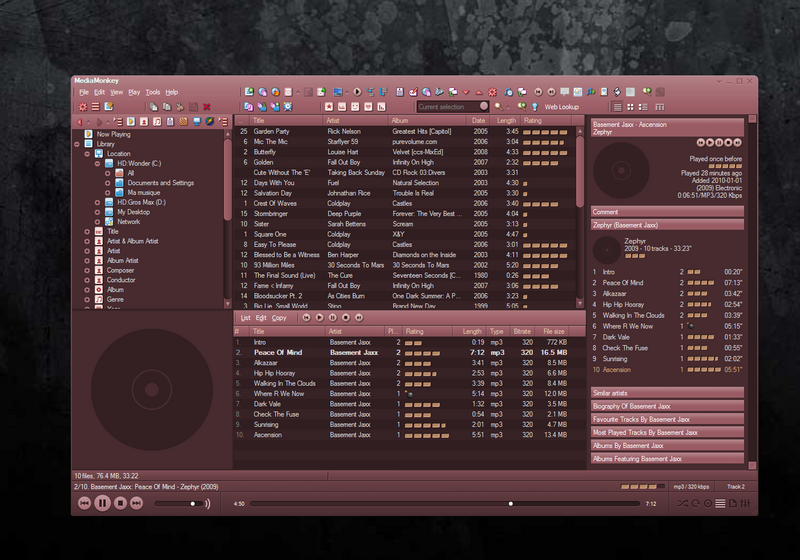 2009.09.07 - New matching skin for Enhancer plugin for winamp. Please see first post for download links. The cyan highlight is a bit irritating, the stars indicators bar are also annoying, other-wise an excellent addition to the few professional skins that are out there.